Our farm was originally settled by our family in 1836 and received the Hoosier Homestead Award in 2008. The farm is located in Southern Indiana where my husband and I started our family almost 29 years ago. We're raising 3 boys, and if that was not enough. Today we have 18 myotonic (fainting) goats, semimental cattle, and maylasian prawn(freshwater shrimp). We enjoy our country lifestyle and also enjoy sharing it with family, friends, and visitors. If you are interested in stopping by just give us a call you may even decide to buy one of our awesome goats. 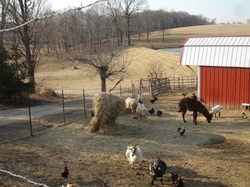 "Goat Talk" is one of our favorite things and we would love to talk to you about our farm, and especially my goats. All of our animals are handled on a daily basis. They are extraordinary pets and fun loving companions!! Enjoy the pictures and visit often for updates on events around the farm.